From left, Lionettes Head Coach Michael Dodgen, Classic sponsor Mitch Wilson and Lions Head Coach Matt Rigsby are ready for two days of quality hoops in Woodbury. If you are a basketball enthusiast looking for something to do between Black Friday shopping and post-Thanksgiving fun with the family then the 3rd annual Mitch Wilson State Farm Classic likely will provide a great escape. The Mitch Wilson State Farm Classic unfolds with nine games taking place all day Friday and Saturday (Nov. 26-27) at Robert A. Gymnasium. 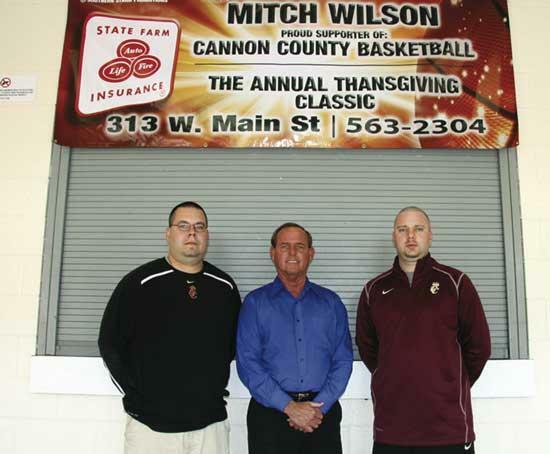 The Classic features both of Cannon County High School's basketball teams, along with numerous tradition-rich hoops teams. Cannon County is hosting the event which is sponsored by Mitch Wilson State Farm for the the third consecutive year. Wilson said he was approached by Lionettes Head Coach Michael Dodgen and Lions Head Coach Matt Rigsby regarding sponsorship at the inception. "I've always been involved in sports in Cannon County and this was something that interested me when both coaches came to me about three years ago," Wilson said. "They have just built on the tournament each year since. There are several top-ranked teams coming in and we hope to continue building on that. It's really good that our fans get to see these teams and that our teams get to play some of them. You compete against the best to be the best and that's what we are doing to do. That's what this tournament is about." Cannon County's teams will conclude both days. The Lionettes face Class AA power McMinn Central Friday at 7:30 p.m., with the Lions facing McMinn Central boys at 9 p.m. Cannon County's teams will close the tournament with tests against Smyrna. The Lionettes face the Lady Bulldogs at 7:30 p.m., followed by the Lions facing the boys at 9 p.m. In all, there will be nine games each day, beginning at 9 a.m. and running through the evening. Among the teams in the field are Riverdale, Shelbyville, Smyrna, Smith County, BGA, Cascade, Franklin County, Lincoln County, and McMinn Central. Dodgen said this year's lineup is the best yet. "Coach Rigsby and I wanted to get the best teams that we could to come to this event," Dodgen said. "This year's collection is probably the best we've had. We have some tradition-rich programs that will provide quality basketball for the fans. Mitch Wilson does a fantastic job of supporting our teams, and he does anything and everything we have asked him to do for this." Risgby said Wilson's involvement has helped make the Classic a first-class event for high school basketball in the area. "The Mitch Wilson State Farm Classic has grown each year and this is the best field yet," Rigsby said. "We are fortunate to have so many people in the community who step up to help our teams and this is another example. Mitch has stepped up for this event and it has make for a quality tournament. There will be good games throughout both days." One of the headline games will be a rematch of last season's Sub-state showdown between Cannon County and McMinn Central. Both teams return key players from those squads and the game could serve as a match-up between two of the state's top Class AA teams.